Due to the current forecast of heavy rain, Clubs have decided to cancel or reschedule rally's planned for Saturday October 22. Please check our events calendar as Clubs reschedule these events. Members and other trail users should take extra caution in the coming days as you travel the trails post this weekend’s heavy rain and wind. Trees could be blocking trails and flooding may have caused bridge and culvert damage along with major washouts. Please report serious damage to the club in your area or to ATVANS trail coordinator Corey Robar at trails@atvans.org . Ride safe and enjoy the trails. Marine Riders ATV Club have reported that the Gater Pit Bridge has collapsed. Long Lake Loggers will be starting the bush mowing on Monday Aug 22. 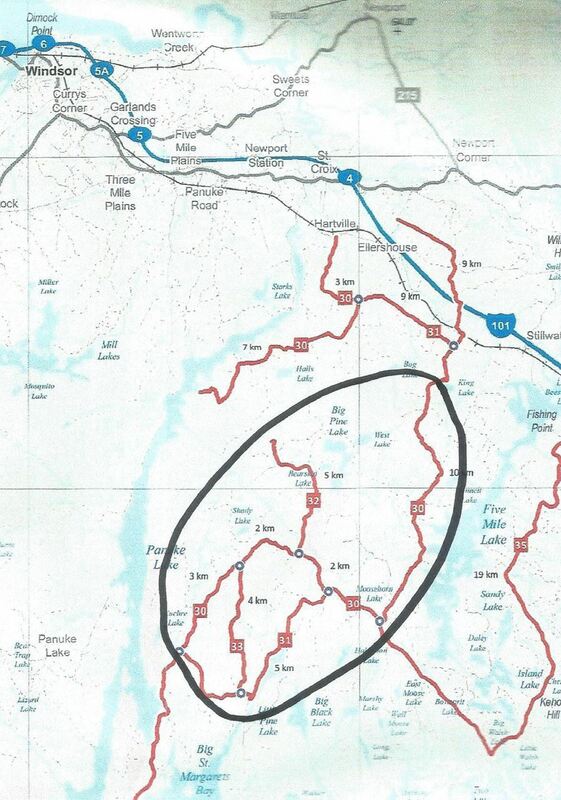 Riders should be aware that for the next month or so they may meet a tractor doing bush mowing on the roads on Crown Land in the area indicated on the map. Please use caution when riding in this area. 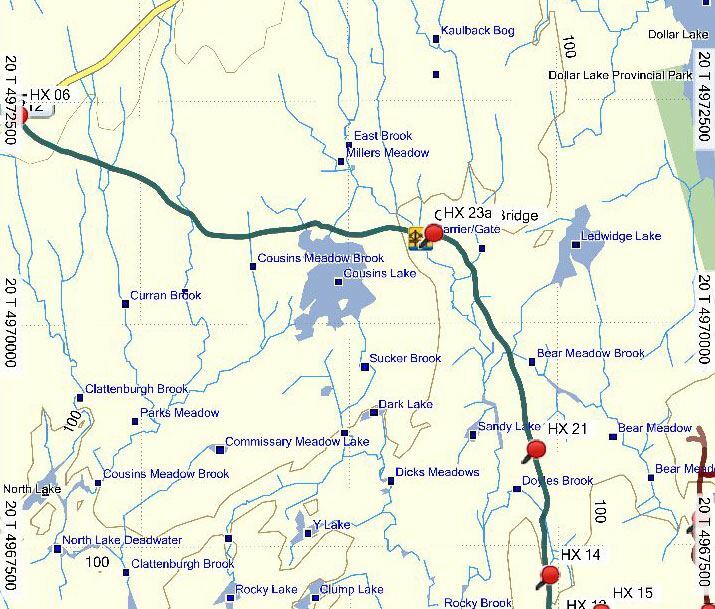 This is the former Bowater land close to Ellershouse and the HWY 101. Thanks. Restrictions on travel and activities within the woods announced last week have been lifted for mainland Nova Scotia. Travel restrictions for Cape Breton were lifted on August 15. "After plenty of hard work by firefighters and the good fortune of rainfall, we are now able to safely open the woods to travel," said Natural Resources Minister Lloyd Hines. "I want to thank Nova Scotians again for their co-operation and understanding while these restrictions were in place. "I realize it has been a challenging week and we are very appreciative of the patience and concern people have demonstrated across the province." The section of Trunk 8 near Maitland Bridge, Annapolis Co., that has been closed since last week is now open but drivers are advised to be aware of emergency vehicles still along the highway. The province will continue to provide updates until the remaining wildfires that are being patrolled are out. Updates can be found at http://www.novascotia.ca/nsfire. The All-Terrain Vehicle Association of Nova Scotia (ATVANS) and New Brunswick All-Terrain Vehicle Federation (NBATVF) are pleased to announce that they have reached a reciprocal agreement to recognize each other’s trail permit/membership making travel in each jurisdiction easier and less expensive. This cross border partnership is a result of strong relationships formed by each association through membership in the All-terrain Quad Council of Canada (AQCC) and recognises the will of our clubs and members to strive to be great friends, neighbours and partners. This agreement has been in discussion for some time. This agreement started as an idea at meetings held between staff and president of both associations over 4 years ago in Fredericton New Brunswick. Past president of ATVANS, the late Roger Mailman would be very happy to see this idea has finally reached agreement. The agreement allows each association to recognize the permit/membership of the other, however, members/permit holders are required to follow all provincial rules and regulations along with any provincial land use stipulations and policies. “Our provincial rider federations have always worked closely together through our involvement in AQCC” said Roger Daigle President of NBATVF. This historic agreement will promote economic activity in each jurisdiction and help grow the sport of ATVing in our region. A photo opportunity will be planned at the border in the near future. New Brunswick All-Terrain Vehicle Federation Inc.